A meteor crashes on the beach near Jagwar, Dreadmon and Ray Fillet. The space rock then cracks open and dozens of alien larvae emerge. Meanwhile, Maligna has captured Slump and Sling (hosts of the Intergalactic Wrestling show) and sentences them to be burned alive for disrupting her plans for the planet Hirobyl. As the two woody aliens are being dragged away, Leatherhead bursts into the chamber and starts bashing Maligna’s minions. The mutant gator is briefly overwhelmed by a large group of soldiers and Slump and Sling attempt to flee on their own. Just then, Wingnut arrives and flies the announcers safely to Cudley the Cowlick, who waits in the sky above. On Stump Asteroid, Leatherhead, Wingnut and Screwloose learn of Maligna’s plans to invade Earth. Stump is excited to cover the event, as it will boost his ratings. 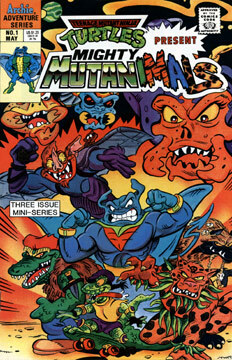 Cudley offers to take the three Mutanimals to Earth and they take off. While in route, Cudley is suddenly zapped by a mysterious spaceship. Back at the beach, the alien larvae have made it to the tree line and begin devouring a path through the jungle, much to Jagwar’s dismay. By this time, Splinter has made contact and dozens of rats arrive and chew through the ropes binding our heroes. Skul and Bean burst into the room and a battle begins. The TMNT get the upper hand, so Bean drops another stink bomb and the villains make their escape. In the jungle, the hungry larvae have turned their attention to Dreadmon, Jagwar and Ray, who flee, and eventually stumble upon Cudley the Cowlick, who has crash landed and looks awful. Previous Article← Archie – TMNT: The Movie III: The Turtles are Back… In Time!